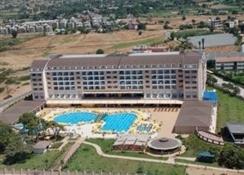 General Description:Laphetos Beach Resort & Spa in Manavgat has 348 rooms and was renovated in 2011. The hotel is located 100 m from the sandy and gravel beach. The closest city to the hotel is Side (18 km). To make your stay more comfortable a conference room, a lobby, a reception, a hairdresser and air conditioning are available. A playground for children is available. The staff in this hotel speaks English. A fresh water swimming pool, seasonally open is available. Refreshing drinks are offered at the pool bar. Sunshades and sunbeds are available free of charge at the beach and at the pool. Accessible from the hotel: airport AYT (80 km). For your entertainment the hotel features a disco. Amenities:For convenience the following services are offered: maid service, medical care, a safe, room service and laundry service. Internet access is provided at wifi-hotspots. This family friendly hotel offers a children's pool to ensure a comfortable stay for parents as well as young guests. Reception hours: 24h Service. Meals:The breakfast type is Buffet and it is provided from 07:00 - 10:00. Evening drinks can be enjoyed at the lobby bar. Sport and Leisure:Activities such as table tennis, billiards and darts are offered at the hotel. Guests who wish to be active on holiday can enjoy activities such as aerobics, beach volleyball, basketball, tennis, exercise in the fitness room and volleyball. Wellness and health facilities are offered where guests can relax in a hamam, at a spa, during massages, in a sauna and in a whirlpool. Additional Information:Additional fees may apply for certain facilities, amenities or activities. 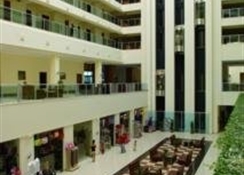 This large hotel offers a range of amenities in spacious and modern surroundings. There are a total of 350 rooms and suites at this beach hotel. The lobby is an atrium with bar and lounge area and open corridors looking down from the floors above. Facilities include a games room, shops, a lobby bar, Internet cafÃ©, air conditioning, an auditorium, nightclub, conference facilities for business travellers and wireless Internet access. Guests are welcomed in the lobby with 24-hour reception and check-out services, as well as a hotel safe and lift access to the upper floors. 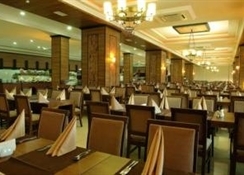 Guests can also dine in the choice of 4 restaurants. For younger guests there is a mini club and children's playground. Those arriving by car can leave their vehicle in the car park. LocationThe hotel is located across the road from a long stretch of coastline in the district of Kizilot and is connected to the beach via an underpass. Manavgat and the resort and ancient city of Side are approximately 18 km away. Antalya Airport is about 8 km away. RoomsThe spacious rooms offer comfortable accommodation with a seating area, air conditioning, a minibar (local charge), satellite TV and a balcony. All are en suite with a bath and hairdryer. Further in-room amenities include a double bed, direct dial telephone, safe, and individually regulated heating. SportThe hotel has a large outdoor swimming pool with children's swimming area and a pool with slides, a spa centre (with heated indoor swimming pool, sauna, and Turkish bath) and treatments and massages are available for an extra fee. On the beach there is a range of water sports available for extra charges, including waterskiing, jet skiing, motor boating, banana boating, canoeing and pedal boating. Guests can also take part in an aqua fit or aerobics session, or work out in the gym. Guests can also play basketball, beach volleyball, tennis (for a fee) or pool/snooker (for a fee). An entertainment programme is provided in the day and evening and there is a hotel disco for late night revellers. Some facilities may not be available due to weather conditions in the winter months. 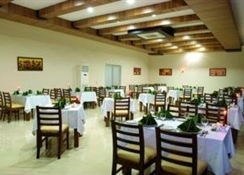 MealsThe hotel offers all meals, including continental breakfast, served in buffet form with local drinks included. Dinner is additionally available Ã la carte. PaymentThe hotel accepts MasterCard and VISA as payment methods.